Here’s another one from the upcoming show. 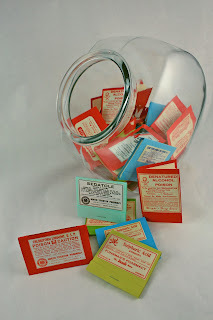 Actually, it’s 40 blank notepads in a glass candy jar. Some are little sewn pamphlet affairs, and others are matchbooks stapled together. All have on the cover a scanned copy of a genuine pharmacy label from what looks to be about the 30s (?). They make for some fascinating reading. Over-the-counter arsenic anyone? How about some “Sedatole”? Seeing as Sedatole consisted of not much more than alcohol and codeine, I’m sure it did the trick. 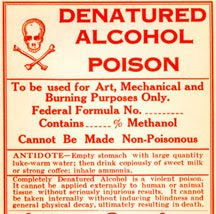 My favorite, though, is the label for denatured alcohol, which is, we are warned, a “violent poison.” It was meant “to be used for art, mechanical and burning purposes only.” I’m trying to envision what sorts of art purposes I could use it for. At any rate, the scans came out great. I’m being conceptual and calling this display Would You Like Some Candy?